You are here: Home / Uncategorized / Healthier Moms = Healthier Babies! Bridging the gap between what we should eat and what we do eat! A concentrate of whole, not part of, fruits and vegetables has the potential of providing amazing health potential for the expectant mom and her baby. It is said that we can’t change our DNA, but what we can do is change the way our DNA expresses itself. Doug Odom, M.D., an obstetrician and gynecologist, was seeing enough pregnancy improvements in expectant mothers who were taking encapsulated fruits and vegetables, that he decided to make “specific” observations. This produce is tops in nutritional value due to the crops being fully ripened, juiced at the farm and dried, all within hours. In the Fruit and Veg Group: Preterm labor, Premature Rupture of Membranes, Pre-eclampsia, Admission to Neonatal ICU, Respiratory Distress Syndrome – all categories had Zero incidents. There were only 83 C-Sections required. The average Gestational age was 39.3 weeks. In the Control Group using only a Prenatal – there were 16 Preterm Labor, 6 Premature Rupture of Membranes, 38 Pre-eclampsia, 17 Neonatal ICU, and 13 Respiratory Distress Syndrome. And there were 117 C-Sections. The average Gestational age was 38.2 weeks. Another interesting fact is that many of the children who are born from a mom who took the fruit and vegetable capsules, love to eat their own fruits and veggies. If that mom did not use the capsules of 20-30 whole produce for a previous pregnancy, that child often dislikes fruits and vegetables. All of that is for the child. But the benefit for mom’s body is to grow back and retain her healthy cells as she is feeding both herself and the baby. This concentrate of produce is helping her body avoid massive free radical damage (oxidative stress) and therefore avoid many complications. This is proven in several 3rd party, double blind, placebo-controlled research studies. Safety at home starts with a healthy body, especially for pregnant or soon-to-be pregnant females. 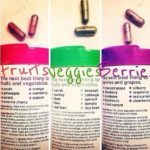 The amazing capsules above aren’t just for pregnant women though- Safety Nick has been taking them for a long time once he realized the benefit and started feeling healthier and dramatically reduced his time spent while sick. His joints feel better, sleep is better and recovery time from being sick is about 2 days VS 7 now. Call Deanna today to get healthier- the natural way!